There’s something special about shopping at this time of year, when the stores are decorated for the season, cheerful music is playing and holiday parties and festivities are just around the corner. And, if you’ve been shopping recently, you know that the makeup counter is no exception, with the holiday color collections and beautiful “gift with purchase” product arrangements. Sadly, all the pretty packaging can hide some not-so-pretty toxic ingredients that are definitely not on anyone’s wish list this season. To make it easier, we’ve put together quick guides of our non-toxic favorites to help gifts that keep on giving all year long. We’re starting with lipsticks, because the pigments & preservatives in them can be a landmine of harmful chemicals. 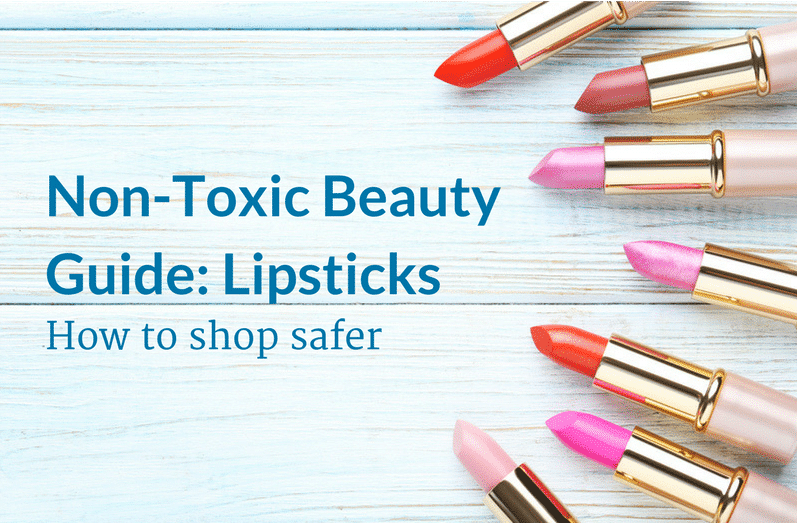 Here’s your handy guide to shopping for non-toxic lipsticks. The main reason that we need to be careful when it comes to lipstick (or any personal care product) is because the industry is incredibly poorly regulated. In fact, the law doesn’t require that cosmetics to undergo FDA safety reviews before they hit the market! Since we wear these products on our largest organ (our skin) and absorb them into our bloodstream, this is a pretty serious issue. Lipstick is one of the worst offenders when it comes to toxicity. Here’s some great in-depth information on how lipstick is made, some of the health hazards it contains from Gimme The Good Stuff. But, for our purposes today, here’s a quick run-down of what you’re looking to avoid, and then a couple of our favorite non toxic lipstick choices. Lead: many popular lipstick brands contain lead, either as an intentional ingredient (shocking, we know!) or as a byproduct from manufacturing process. It’s toxic, it’s correlated with terrible health issues including cancer and reproductive toxicity and you don’t want it in your life. Preservatives: most cosmetics include preservatives, like parabens and BHA or BHT, and have been linked to all kinds of nasty stuff from breast cancer to endocrine disruption. Fragrances: this is a big one. Fragrance ingredients are considered trade secrets, so manufacturers do not have to disclose specific ingredients. Unfortunately, this means the one word “fragrance” on a cosmetic label can be a hiding place for really toxic stuff like hormone-disrupting phthalates that can lead to a host of health issues. Keep in mind that even “natural” fragrances aren’t necessarily safer. In lipsticks, you may be wondering why there are fragrances, and often it comes down to “masking” fragrances to cover up other scents from the chemicals used to create the product. Remember that the word “unscented” isn’t regulated by the FDA, nor is “hypoallergenic“. Ready to pucker up under the mistletoe? Now that we’ve been total downers about lipstick, we’re going to redeem ourselves with three awesome brands you should check out for safer, non-toxic lipstick to wear merrily all season long. Why we love them: Beautycounter Lip Sheers go on creamy and sheer, but build up to a nice, full color that’s designed to complement any skin tone. For a bolder look, the Color Intense Holiday Set gives you five vivid shades to keep or gift. They’re moisturizing, flattering and don’t contain synthetic fragrance. The brand also offers Lip Glosses that can be worn alone or over the Lip Sheers to change up your look. Why we love them: These eye-poppingly gorgeous shades come in a luxurious gold packaging that belies their super-cuddly, Vegan soul. Available in a classic lipstick as well as a lip crayon, they’re created from “gorgeous ingredients you could easily eat,” like shea butter and coconut oil, and contain no synthetic fragrances. Why we love them: if you want a bright, bold red lip this season, you don’t have to settle for one that contains lead. From a pale Seashell to a deep Medusa, these lipsticks are packed full of paraben, phthalate and lead-free pigmented goodness and use ingredients like jojoba oil to nourish while you wear them. Not sure which one to try? They make it easy to pick a shade showing them off on the same models in their Lipstick Guide. The good news is, thanks to brands like these, you don’t need to go without beautiful, creamy color in luxurious packaging that makes it fun to put on makeup. And there are amazing resources like the EWG’s Skin Deep Cosmetic Database’s Lipstick Product rankings, to help you separate the good from the not-so-good when it comes to non-toxic lipsticks. So, go ahead, dig through your cosmetic drawer and see how what you’re wearing now stacks up in safety, and then find some new options you’ll love even more. Remember: one of the reasons buying cosmetics is so fraught with anxiety is that they by nature need to be pigmented and preserved. You’re going to have to consider the pros and cons to any cosmetic purchase, no matter how “clean” or “natural” it is, and decide for yourself. Finding a product with no tradeoffs probably isn’t possible when it comes to cosmetics. We are hoping that our guides give you an informed starting point, so you can make better decisions for your makeup bag.